K9 trading cards are an excellent way to spread the word to the local community about the important work our police, therapy and service dogs provide. 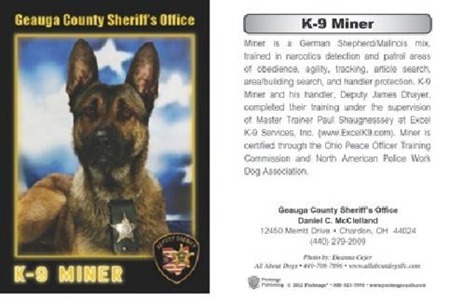 The K9 Trading Cards allow you to provide detailed information about your K9 partner, the training you have received and the jobs your perform to help the community. Full color and UV coating on front. Minimum order of 1000 cards per image. Delivery time is 3-4 weeks. No additional sitting fee, so call to schedule your appointment today! Includes patch, badge or logo on front. Includes photo session in studio.